The Yamatwao bridge, southern Rupununi, Guyana. 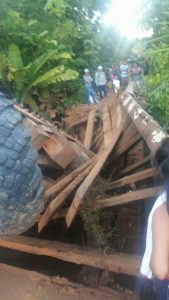 The Ministry of Public Infrastructure on Saturday deployed a team to the South Rupununi to assess damage to a key bridge that collapsed under the weight of a flatbed truck that was carrying an excavator. The assessment would focus on the “severity of the damage and cost to rehabilitate the Yamatwao bridge. “The overweight vehicle overextended the bridge’s capabilities, thereby causing the collapse,” the ministry said. Government used the opportunity to warn road users, who do not adhere to the weight limits, that they would be held responsible for damage and destruction to roads and bridges. “This incident is not the first of its kind and road users are reminded that they will be held accountable in instances of non-compliance to weight limits,” the Public Infrastructure Ministry added. 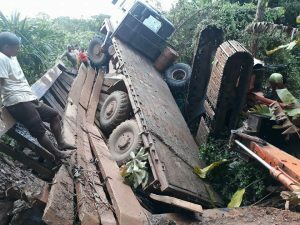 The Ministry of Public Infrastructure said bridge collapses also affect communities, since they make traffic impassable and cut entire villages off from the rest of the country.